The tale finally feels old as time with a lackluster pace and a few new completely forgettable songs thrown in to bloat it out to an excessive two hours. Made for anyone who has somehow grown tired of watching the animated masterpiece. The old saying “lightning never strikes twice” may have been debunked, but it still holds true in the case of Disney’s Beauty and the Beast. Clinging to nostalgia, there’s not enough new to warrant director Bill Condon’s (Dreamgirls) live-action existence. While never quite a Gus Van Sant shot-for-shot remake, it comes pretty close at times. Screenwriters Stephen Chbosky and Evan Spiliotopoulos may get full credit, but all they’ve done is padded out Linda Woolverton’s original screenplay to an excessive two hours. Thankfully, Howard Ashman and Alan Menken’s songs save the day whenever the pacing starts to lag. For the remake — with Ashman having passed before the 1991 classic was even released — Menken has joined forces with Tim Rice to add a few new songs, all instantly forgettable. The tale as old as time barely moves away from the original. The Beast (Dan Stevens), and his castle full of workers have been cursed by an enchantress. Years later, Belle (Emma Watson) spends her time reading books, wondering why she has to put up with the sordid village her father Maurice (Kevin Kline) has raised her to be an outcast in. Gaston (Luke Evans) preens around town with his unrequited piner LeFou (Josh Gad) in tow as the women fall at his feet even though he only has eyes for Belle. Soon enough, Maurice is trapped in the Beast’s castle, with Belle taking his place as his captive. Now, Lumière (Ewan McGregor), Cogsworth (Ian McKellen), and Mrs. Potts (Emma Thompson) must find a way for Belle and Beast to fall in love to break the spell before they all become stuck as household appliances forever. I did not have high hopes for the remake. From the first trailer, something seemed off to me and I couldn’t put my finger on it until Disney finally released the first clip of Belle singing her theme song. Then it hit me, it looked like a live TV production. Was this going to be no better than the recent string of Peter Pan, Grease, Hairspray, or even worse, The Sound of Music? The good news is that once the film moves past this opening number, it manages to open up and feels like a real movie. The bad news is, as good as the cast may be — particularly Stevens as our beloved Beast — the visuals are never as good as they should be. Beast fares the worst. Ron Perlman worked wonders beneath heavy makeup back in the ’80s TV show — something this film easily could have been nominated for had they used any — but alas, they have gone and made the Beast a complete motion-capture study in wasted opportunity. 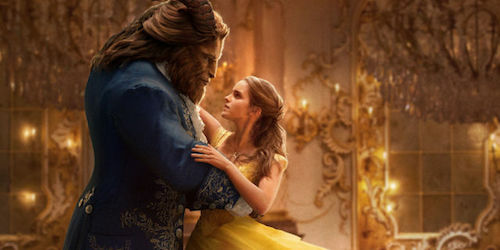 As if that isn’t bad enough, this Beauty and the Beast feels much darker than the original masterpiece. It could just be that it already was, but never felt that way considering it was animated. But the ending to this just feels warped in live action and ultimately creepy. Anyone looking forward to this will probably love every minute of it. As a huge fan of the Best Picture nominated, Best Animated winner, all I could do was breathe a sigh of relief that it isn’t the disaster I had prepared myself for. While it may get the songs stuck in your head, you’ll only find yourself hearing the originals, having ingrained themselves into our subconscious over the last 26 years. Disney will continue beating their live-action remakes into the ground — Aladdin has already begun the casting process, along with The Lion King — we all know no one milks a cash cow the way the Mouse House does. Unfortunately for the rest of us, all we can do is be grateful that Beauty and the Beast may not be as good as The Jungle Book, but it’s also never as mediocre as Cinderella, and nowhere near as painful as Maleficent. Although, it is every bit unnecessary as can be.